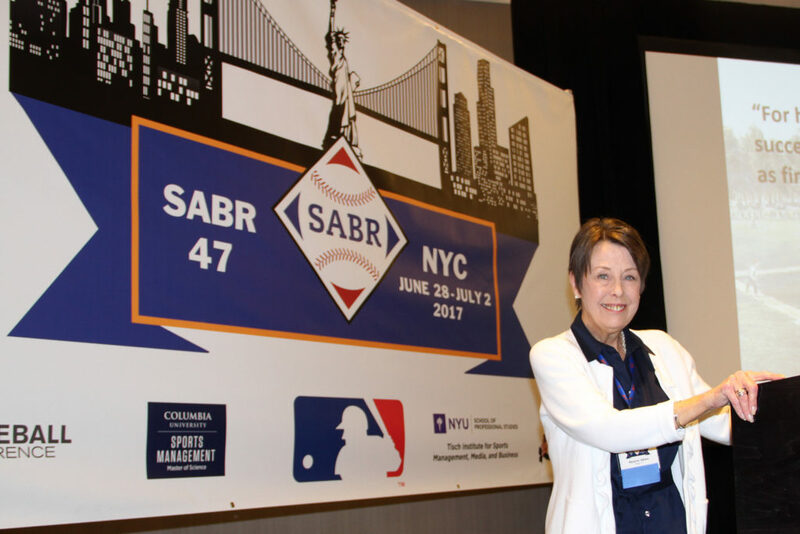 Marjorie Adams capped off her exciting SABR 47 (the National convention of the Society of American Baseball Research) experience by receiving an Honorable Mention for her oral presentation “Doc Adams: A Founding Father of Baseball”. Congratulations to Marjorie for this acknowledgement of her engaging and educational presentation on her great-grandfather, a pioneer of our National Pastime. Marjorie P. Adams <info@docadamsbaseball.org> was born in NYC between the year Jackie Robinson signed with the Brooklyn Dodgers and the year he won the National League MVP. As a child, she was never interested in sports of any kind but the sounds of a Yankees game on the radio were always comforting because it meant her father was home and ‘puttering’ around the house doing chores for her mother and so all was right in her little world. She much preferred playing with her dolls and reading American History: the latter remains one of her main interests. She graduated from Stephens College in Columbia, Missouri (BA ’71) and most of her career was spent in the furniture industry. While coming late to an interest in the history of our National Pastime, she’s playing catch-up as fast as she can and enjoying every minute of it. Over the last six years she has attended vintage baseball games from Maine to Pennsylvania to see and learn how the game was played in Doc Adams’s day and to educate people on his contributions to the game. The Doc Adams website, www.docadamsbaseball.org, thanks to SABR member Roger Ratzenberger (and many others), contains a wealth of information on Doc. In honor and memory of her father and grandfather (Doc’s youngest child), it is Marjorie’s mission to see Doc Adams inducted into the National Baseball Hall of Fame.